HINT — and boy do you guys need one! What category of creatures use litter boxes? Mar — no puzzle pieces. Sorry! Aggghhh… You have out done yourself. My mind is buzzing away but no ideas are coming… Sigh. Raven — if you’re hearing a buzz you likely need to blow harder. I have sent another GUESS – pure guess – based on your comment clues. Have a feeling it is probably just as off the mark as my first. Mumma — I note your response. You also have my favorite wrong answer. I really do wish I had come up with that one! If Raven doesn’t have any ideas, the rest of us are sunk! Kelley — what does it take to win? Karen — I am sprinkling clues all through the comments! Well, of course it’s all clear as a bell NOW. Great. I now have Motorhead lyrics in my head, but no puns…. Susan — try Al Hirt music. Rosidah — you sent a brilliant guess but the writing on the card is only a distraction. Mercy, woman! All that for a noun? Seems like it would be a whole paragraph! This one’s gonna drive me nuts. One seven letter word that isn’t compound, but the elements in this photo that make it up are! Barbara — do you enjoy any card games? I got here as early as i could, and still have no answer. Betty — you’ll never win at cards that way! I’ve already sent you the wrong guess. I’m not doing it again! Karen — that’s okay. Go curl up with an adoring, furry companion. Shelly — I sure seem to be getting everyone jazzed up! eeek – that seems to be my response nearly every week, though 🙂 Guess sent…. Alastair — Gabriel likely heard you blow that horn! The hint has me guessing that the head belongs to a European bunny… because he’s using the metric system. STILL no clue. Can’t wait to see what this one is! Susan — typo — Amoeba wanted taken to work and I was rushing. That was just me being cranky because I couldn’t get it… and geez, you even told me to try Al Hirt (whose playing I like quite a bit, btw!). Even after seeing it, it took me a minute… and then WHOA! That was a good one! I am mentally exhausted trying to figure this out. Too bad Mrs. Jim is gone (two whole weeks) or she might know. I looked at the picture last night BIG and still didn’t recognze the kitty litter. We us the ‘clumping’ kind. I didn’t recognize Pimmie either. Jim — is it okay that I have no idea what you are talking about? I didn’t know about that kind either until our Karen’s cat, Amber, came to live with us. Her litter box came also. Oh yes, any of the thirteen cards in the TRUMP suit will be a trump card. Granted, in the trump suit the Ace will be high trump. This one happens to be the Ace of Spades but spades doesn’t have to be trump. Poker doesn’t use trump suits but a Spade, say 10, takes the same card in the other suits.. In bridge naming Spades or Hearts as trump means less trickis are needed for game. And no-trump less tricks still. Besides, I don’t play cards very much. I play 42 (domino game) and we only have seven trumps if we have a trump suit at all. Fives are best being trump suit because the double-five domino, high trump domino then, counts ten points. Jim — I know about clumping kitty litter, thank you. I had cats for years. I don’t know about Pimmie and Ellie. And, if you’re playing poker and two people have the same pair and matching high cards, the suits have a hierarchy. Spades are highest — also known as trump, at least in this part of the world. The Ace of Spades is the highest card in the deck — also known as a TRUMP. The bunny is a pet. The litter box was Amoeba’s bright idea. He hoped it would steer you away from “bunny” and more toward “domestic animal”. I told him he wasn’t helping. No, Amoeba didn’t help. ’cause that made me think of cats. Then I couldn’t get off of cat hair (hare), only that was two words. You are way too devious today! I’ve been searching through card games and Al Hirt music that sound anything like they have to do with cats, but nothing yet…. Al Hirt is a TRUMPET player …. Barbara — Alastair got it without the hints. I think it has to do with how one perceives the el;ements in the photo. That’s why these are easy for some and impossible for others. The Al Hirt clue helped – I googled him and it came up with lots of pictures of him with a trumpet!!! Thanks Quilly, if if I hadn’t got it right it was a very enjoyable brain teaser! I thought it was a bit of a stretch, too. Amoeba’s bright idea was not illuminating. What does pebbles-in-a-box have to do with a trumpet? Karen — kitty litter. Many domestic pets use litter box. 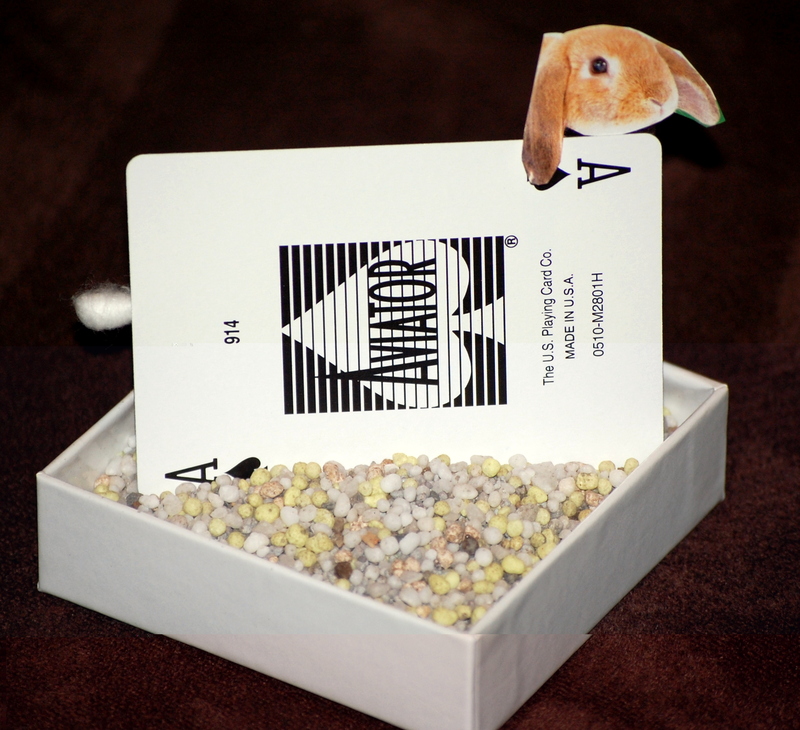 Polona — I cut the rabbit’s head out of a magazine and tapped it to the card. I couldn’t get my printer to work yesterday or I would have used a dog’s head and made it fit. I’ve been a little behind lately and this was the best I could do when the realization hit that it was Sunday and I needed a Punny Monday. I try to keep a couple of things ahead, but life happens. Ohhhhhhh GOOOOOD GRIEEEF! No WONDER they needed hints! That was really a STRETCH!!! Wow, Alastair did it without the hints. Thumbs up! I enjoyed your explanation about this Punny Monday. Thank you :). nahh, I took the Al Hirt hint (as mentioned in earlier comment)…. But it was fun finding out! I think my answer would have been unprintable.